According to Norse legend, The Vorslung were a brave if somewhat ill-fated band of bloodthirsty warriors, who married beautiful giant women, constantly waged war and generally made a complete nuisance of themselves. Eventually they were wiped out but as legend has it they vowed to return to avenge their honour and wreak a bit more havoc. Last Halloween, Zodiac Mindwarp, Cobalt Stargazer, Jack Shitt, and The Cat did battle with Alice Cooper at ancient steam engine shed, the Chalk Farm Roundhouse – significantly, said to be built on the site of Viking settlement. We Are Volsung is the title of their new album. When The Quietus asked me to pen some kind words about Zodiac Mindwarp and The Love Reaction, I had reservations. Zodiac (aka Mark Manning), and Cobalt – his real name, go way back, and most of our encounters have ended in carnage. We first met one another by chance at The Matrix recording studio in 1988, for our twinned mega bucks labels. They were a terrifying prospect, proper greasy bikers, covered in tattoos, belting out heavy metal paeans to their virility, spaceships, and what they would like women to do to them. It seemed like they were succeeding rather well, as the shared recreation area at the studio was filled with models and weaponry. That they grunted in broad Yorkshire accents made them all the more intimidating – my own band did our best to keep ourselves to ourselves, avoid eye contact, and not end up on the end of their bike chains. Then something great happened. Seemingly rather interested in our own distorted riffs bleeding through the soundproof door, Cobalt wondered into our control room and introduced himself. He brought Zodiac in, they had a listen, professed their admiration for our recordings, then shared beers. It was a proud moment… and a useful one I felt - in case I ever got into a fight. Cobalt is a karate black belt. We spent great times hanging out at the same London clubs, enjoying our first flush of fame, and frittering our recording advances on all the powders, pills and potions a young man should be spending his ill-gotten gains on. We both managed to stuff up our ascending careers pretty spectacularly, but The Zodiac Mindwarp gig at the Town And Country Club must rank amongst the most beautifully misjudged acts of self-destruction of all time. Having had a two hit singles, the band seemed all set to take on the world… in record company parlance, that means breaking America. To make this happen, a band needs the full support of the US label, not just for their release to be serviced and forgotten, which is usually the case with British bands. Having got wind of this breakthrough English rock act with US stadium potential, the world head of Polygram Records, the legendary Maurice Oberstein – a stick thin giant with a Russian hat, a helium voice and a red setter constantly at his side - flew in to see what all the fuss was about. Now as anybody familiar with the attire of outlaw motorcycle gangs and its attendant musical acts knows, there is a certain amount of imagery borrowed from German politics in the first half of the twentieth century. Iron crosses, skulls, black leather, storm trooper helmets. Perhaps whoever was managing the band at the time hadn’t really made the connection… a stage resembling a Nuremberg Rally and band sporting German gear might not go down particularly well with a man called Obberstein who wielded enormous power in the music industry. Had they toned it down, they could have been as big as Guns N'Roses – who regularly opened for them and acknowledge their influence - or The Cult. I next met Mark Manning in the late 1990s at the start of my absinthe adventures. 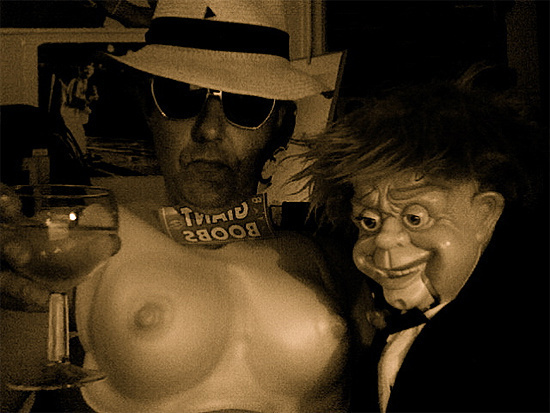 I was to meet a man called Tom Hodgkinson – from The Idler magazine, to give him a taste of the green demon. Never having set eyes on him before, he said he would be with an old waster called Mark Manning whose band I might remember. We got slaughtered on the green stuff, and continued to do so for several years. Zodiac Mindwarp and The Love Reaction were practically the house band at Idler events. Mark was by now, quite a successful author, having penned several classics such as Fucked By Rock, Crucify Me Again, and Bad Wisdom with Bill Drummond. We drank ourselves through the millennium, played the great Idler parties at the Tardis in Farringdon, and lived at The Colony Room. Mark Manning, apart from being brilliant company (usually), is a deranged and dangerous genius. Before christening (or whatever the opposite of christening is) himself Zodiac Mindwarp, he was, and still is, a highly regarded painter and comic book illustrator. His Bad Advice columns in The Idler made him the most agonizing of agony aunts, and in less enlightened times might have landed him in prison. He is one of the least responsible grown-ups I have ever encountered – which is a good thing. The only time I had harsh words with him was at a children’s Easter egg hunt in Devon. Although our kids thought his dagger throwing skills marvellous, most of the grown-ups were utterly terrified. He has been known to carry a sword-stick and apparently, having taken umbrage with a group of drinkers, sliced their table in half. It is wonderful that some poor buggers have decided to risk life and limb to sign Zodiac Mindwarp And The Love Reaction again. We Are Volsung is a dirty biker rock classic. It is packed with greasy riffs – Cobalt Stargazer – apart from being a absolute gentleman, is an fabulous guitar player, and Zodiacs rather lovely lyrical poetry… what’s not to love? Live, the band is a full-on rock & roll assault – exactly what the world needs these days. Perhaps now that they have matured a bit, and got a young drummer who wears silver spandex shorts, they can conquer the world at last. Just imagine Zodiac Mindwarp as the biggest rock star on the planet? He does… and always has, and he might just be right.